As a mom, wife and food blogger, keeping my life and things around me organized helps me get things done quicker and more efficiently. Methods like this recipe binder are just a small part of what keeps things running smoothly around me. I wasn't always this organized and I'm sure I still have alot more to learn but ever since starting systems like these, I find I can think clearer and get so much more done in a day. I keep it up on the shelf where my cookbooks are in my kitchen. Whenever I want to add a few sheets or write a little something in, all I have to do is pull it down and flip through it. I also like to keep pages I'm using during that specific week in the front. Pulling the pages out and moving them around is easy with a binder system like this one. 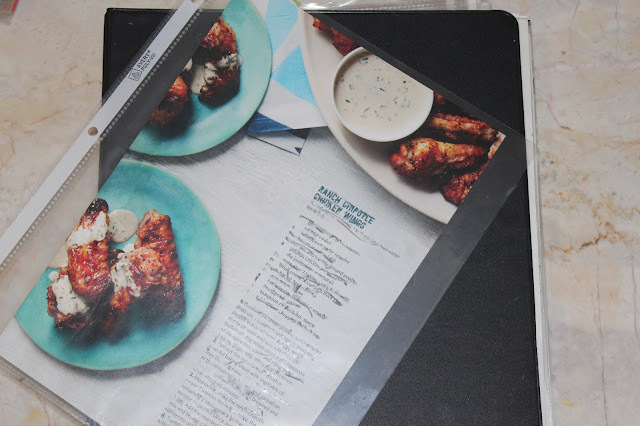 If you find your recipe tear outs and ideas becoming a hot mess, try this binder idea, all you need is a basic plastic binder and a couple of packs of plastic sheet protectors to get started. You can get fancy and decorative or keep it simple if you like, but wait and see how much easier menu planning and shopping list writting becomes when everything is one place. I've had this recipe binder system for as long as I can remember, I think just as soon as I started cooking even. When you develop and post your recipes online as I do, you need to keep a neat organized system. But this is not just for food bloggers, it's beneficial for any home cook or chef alike. So what exactly do I keep in this binder? Any cooking related papers really. But lets get specific. Who else gets all sorts of magazines and tears a recipe out only to misplace the page after putting the dish on the menu for Tuesday nights dinner and shopping for all of the ingredients? I can't be the only one this has happened to, I'm sure! To avoid this from reoccurring, all magazine tear outs go into a folder in my desk organizer titled RECIPES on the front. Then, once a week or month or whenever it gets close to overflowing I go through them and select the ones I'll definitely gain inspiration from or plan to try and toss anything I've changed my mind about. I load them into this very basic binder I purchased from an office supply store many years ago, (it's held up well) cutting them down to size if needed and sliding them into clear plastic sheet protectors (also from any office supply store) I pre-fill my binder with. The only real specification I had when choosing this binder originally was that it have rings large enough to fit a whole lot of paper I planned to pack into it. Sometimes I'll be doing random things throughout my day like eating a bowl of cereal for breakfast or sitting in my car at carpool time and a brilliant recipe idea comes to me. Since I'm not around my main notebook where all my ideas and thoughts usually get jotted down, I resort to clips of papers of all sizes to scribble quick notes which end up going in the folder and then into the binder as well. Another thing I do often is photocopy some of my favorites from cookbooks I own on my shelf and put them in my binder to avoid spilling sauces and breading all over the beautiful cookbook pages and make them easy to find when I need them on short notice. And lets not forget the internet, the main hub for recipe inspiration what with Pinterest food boards, Facebook cooking groups and Whatsapp neighborhood and family groups. Any recipes I've taken the time to print from all around the place end up going into this binder as well for safe keeping. Another scenario that sometimes takes place is where I haven't planned a dinner or I make changes to my dinner plans and I just start going wherever my pantry, fridge, freezer and mind takes me. This is where my whole process of recipe development begins. Halfway through stirring a little something I realize this is a recipe I've just made up and can absolutely share with my blog reader friends. Every ingredient gets measured out and written down so that my recipes will be absolutely accurate when posted. I'll often pull those very sheets out of my binder while further developing and cooking recipes up a second or third time and make little notes of what I did or something I changed to reference later when writing them up, finally resulting in those recipes you find on my blog. I'm sure you get the gist. This recipe binder is one great hub of recipe inspiration, gathering, developing and protecting recipes I come across. I also do a recipe binder clean out every few months, tossing any pages I've decided I'm not actually interested in or ones I feel I've gotten enough inspiration from already. Sometimes they are recipes of my own I've decided I'm not happy enough with after all to actually go ahead and publish them. I actually have some recipes I wrote down in there dating back to 2008 when I first started my binder but I like to keep it to the minimum so it doesn't end up overstuffed which just becomes overwhelming, defeating the whole purpose. Tip #1 Start today. Don't push it off because the pile of paper only grows with so many incredible recipes out there. Get yourself a binder and sheet protecters, and then sit down to watch your favorite youtube channel while slipping those pages into place. Tip #2 Be very selective on which pages you are keeping. Having too many recipes overwhelming you in there may dissuade you from opening it up at all. 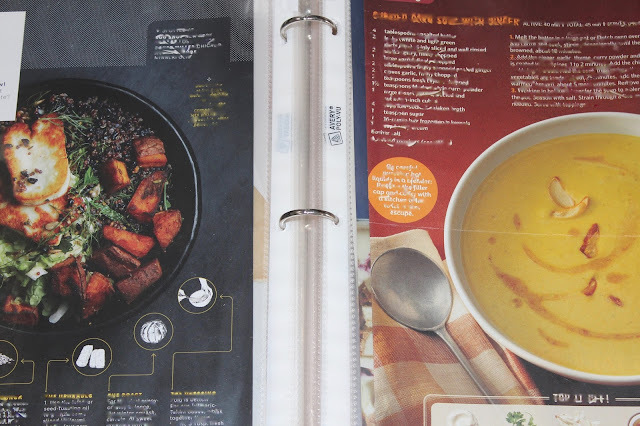 I like to flip through and move recipes I want to cook in the coming weeks to the front. The ones I consistently don't find myself getting to, get tossed. You may think you have time to make that dough recipe from scratch but find that you end up buying some frozen dough at your grocery that's just as good. Tip #3 Keep a clipboard standing in a corner on your counter. When your ready to cook a recipe all you need to do is clip a sheet protector into place and you have your recipe right in front of you without having a whole book full of recipes taking up much needed space. Tip #4 Keep your options open. If a recipe binder isn't the thing for you, consider a box or photo album filled with index cards or a pretty notebook with pages taped in. If it keeps your recipes all in one place then it does the trick. If you prefer paperless organization, consider scanning your papers into your computer, organizing them there all in one folder and accessing them from your computer, phone or iPad when you need them. You'll be surprised at how much easier the cooking process will become with a more organized recipe system to turn to, no matter which you choose. Do you have a system of your own for keeping your recipes organized all in one place? Please give me your tips, I would love to incorporate some into my own! I'm sure we can all benefit!